Good survival of Green Forest and Revolution lettuce (sown September 24) in our hoophouse after the Big Freeze, on January 10. We keep a list of lettuce varieties for each season. We had extremely cold weather at New Year, -3F on Jan 2 and Jan 3, followed by -8F on Jan 6 and -9F on Jan 7. In past years we did not often need to add inner rowcover over our crops in the hoophouse at night, but in recent years, this has become more common. Our guideline is that if we expect the night-time low to be 8F or lower, we use rowcover. 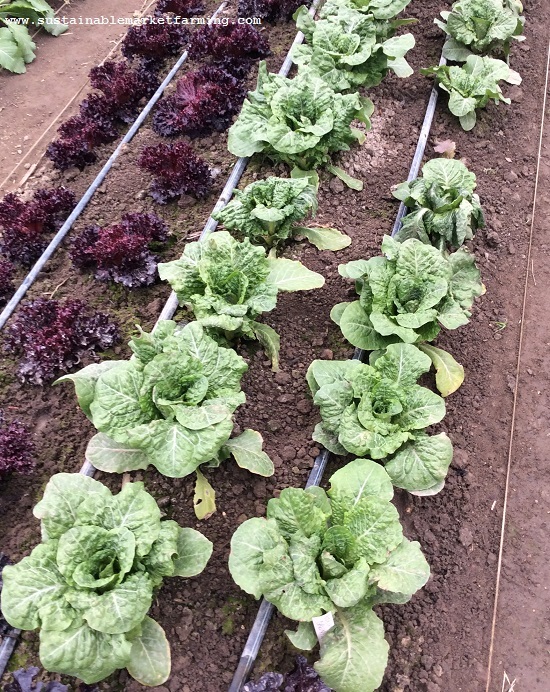 This winter, even with rowcover, we lost some lettuce and pak choy. Here are some before (December 20) and after (January 10) photos and notes. Merlot lettuce on December 20. 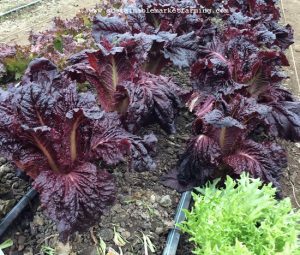 Merlot lettuce from our September 15 sowing on January 10. Merlot is one of our favorite reds and previously we regarded it as one of our more hardy varieties. 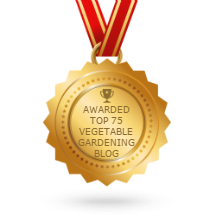 Other ones from last year’s list of hardy varieties include Green Forest, Hyper Red Rumple Wave, Tango, Winter Marvel and Red Tinged Winter. Hyper Red Wave (as we call it for short) didn’t do so well either. Hyper Red Rumple Wave from our September 15 sowing, on January 10. Nor did Outredgeous from the earlier sowing, although the later sowing did better – the plants were smaller. Often smaller (younger, not stunted!) 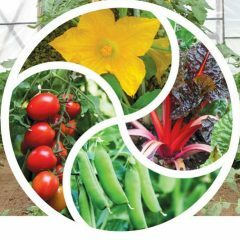 plants can survive colder temperatures. Outredgeous lettuce from our September 15 sowing, on January 10. Outredgeous lettuce from our September 24 sowing still alive but with some damage on January 10. 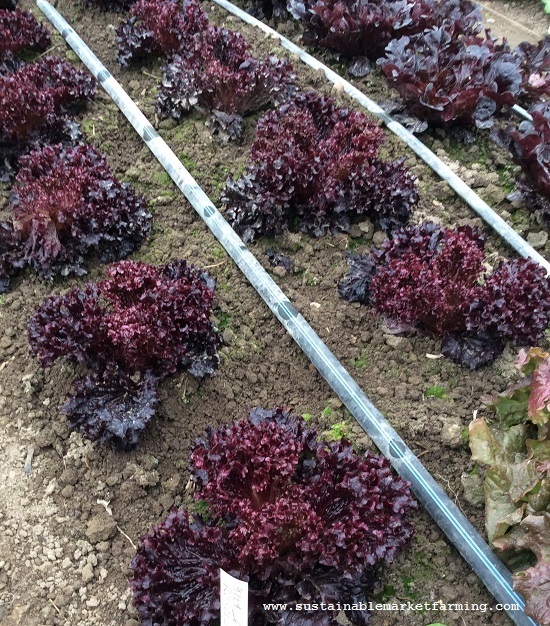 The real stars of red lettuce for cold-hardiness this winter have been Revolution from Fedco Seeds and Buckley from High Mowing. Revolution lettuce in the foreground, Buckley in the background, on January 10. Another big star is Red Tinged Winter from Fedco Seeds. That’s the one I harvested leaves from on January 10. 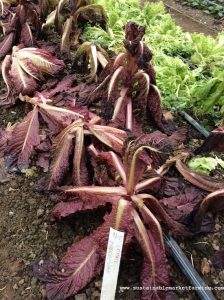 Red Tinged Winter lettuce from our Septemebr 24 sowing in our hoophouse on January 10. Tango lettuce from our September 24 sowing on January 10. And, for green lettuce, Tango, also from Fedco, came through, as always. 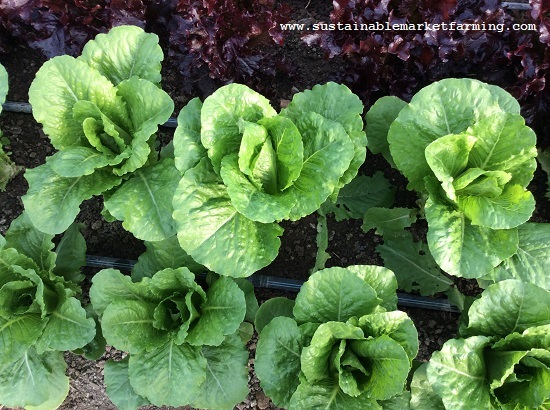 Green Forest lettuce from our September 15 sowing on January 10. Our Green Forest romaine had mixed results. Once again the bigger, older sowing survived less well. Hampton lettuce from our September 24 sowing. One plant has collapsed with sclerotinia lettuce drop. Other green lettuces include Hampton and Ezrilla, two more of High Mowing’s Eazyleaf lettuce varieties. Not as hardy as their red Buckley, but not as wimpy as some. The older sowing of Hampton died, but the younger (seen here) mostly survived. We did not have any Ezrilla in our later planting. Now I wish we had, as I like this lettuce. Ezrilla lettuce from our September 15 sowing on January 10. The damage was quite variable. Remember that these lettuces have been through very cold temperatures. That any survived is remarkable. We will learn from this and adjust our variety list before next winter!